A jammed-pack house of 250 enjoyed all the terrific festivities offered by The National Fitness Museum during its 2008 Hall of Fame Induction Ceremony. “Its like a big, extended family gathering for a very special event” says John Figarelli, founder and executive director of The National Fitness Hall of Fame & Museum. “The inductees are among family, friends and fans; which makes the intimate evening ever so enjoyable. Master of Ceremonies Don, “The Don of Sports” Figarelli along with co-hosts, 2007 Hall of Fame Inductee, Gilad Janklowicz and Dr. Bob Goldman, a 2006 Inductee, made the evening entertaining and fun for all! The Induction Class of 2008 in attendance included: Cory Everson, Bob Gajda, Kathy Kaehler, Charles T. Kuntzleman, Don Powell, Dr. James Stoxen, Michael Thurmond and Tamilee Webb. 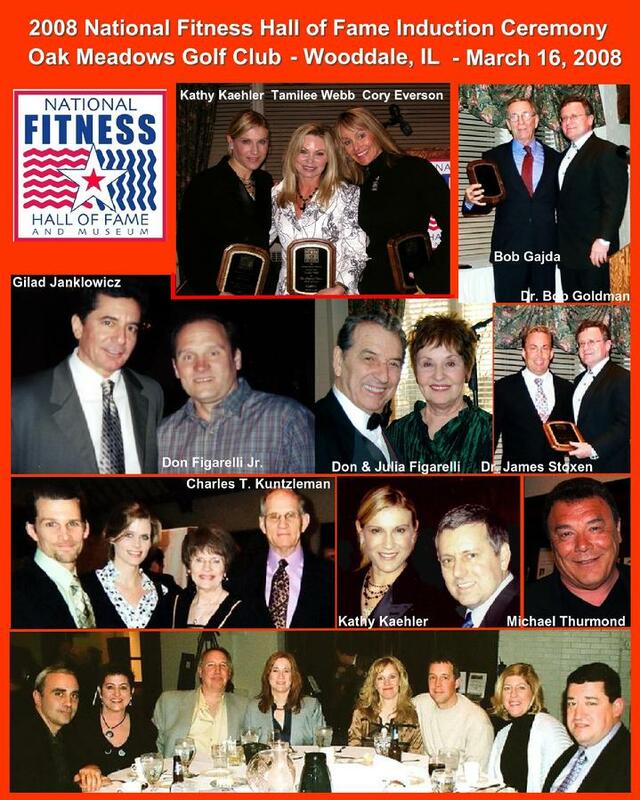 These “Hall-of-Famers” are voted, by their peers, as the “Best of the Best” in the fitness industry. Once again, this great event was combined with the Annual “Don of Sports” Awards, this being its 3rd year. The “Don of Sports” Award recognizes those individuals who have dedicated time and service to the community and demonstrated outstanding sportsmanship. This year’s DOS recipients, Jim Lombardo and Mary Link were surrounded by family and friends making the event ever so memorable.